When you update your time zone preferences, your existing saved and scheduled reports will be migrated to your preferred time zone automatically while future reports will also be based on your indicated preference. Updating your time zone preference will only affect your earnings data going forward and does not apply retrospectively. Learn more about time zone reporting in our Help Center and make sure you’re getting the most up-to-date earnings data on your account. We know that access to the most up-to-date data on your account is important in understanding how it’s performing on a daily basis. Up to now, we’ve reported your daily earnings based on Pacific Standard Time (PST). Over the next couple of weeks however, you’ll be able to view your daily earnings based on your local time zone, giving you the latest information. You can set up your time zone reporting preferences from your account in a few quick steps. From the Account information section on your Account settings page, a field now exists for time zone information where you can select your preferred local time setting. When you update your time zone preferences, you can expect to see some anomalies in your local earnings data for that day. Depending on your local time zone, you’ll either see a reduction or a spike based on whether the change means you are gaining or losing hours - keep an eye out for a notification in your account on this. It’s important to note that this does not affect your payments data which will always remain in PST. to give you the option to let our optimization specialists proactively analyze your Analytics account data to find new ways for you to grow your business online. We’ll help you understand how people find your site, how they navigate through it, and how they become loyal users - and we’ll help you take advantage of Analytics features like Content Experiments to help you determine the most optimal layout for your site. If you’ve linked your AdSense account with Analytics, opt in to the Account specialists data sharing setting under the Account Settings tab. Then we’ll be able to build targeted recommendations to help you improve the user experience on your site and monetize with AdSense more effectively. Additionally, if you want to help make our other products work better for content publishers like yourself, you can opt in to the existing With other Google products setting under the same Account Settings tab. Sharing your Analytics data with other Google products can help us create new publisher solutions to achieve your website goals. For example, AdWords could recommend more effective keywords based on an understanding of how users behave on your site or AdSense could suggest more effective ad placements. You can find full instructions for updating your Analytics settings in the Analytics Help Center. Your website data will not be used for any purposes other than those that you specify in your settings, which you may change at any time. If you haven’t linked your AdSense account with Analytics, you can learn more about using Analytics with AdSense in our Help Center. Finally, to receive more targeted optimization tips, make sure you’re opted into Performance Suggestions in your AdSense email preferences. We look forward to helping you grow your site! Google Analytics can be an incredibly valuable source of information for AdSense publishers, and today we’re announcing a new way for you to use those insights to improve your site’s performance. Google Analytics has created a data sharing setting to give you the option to let our optimization specialists proactively analyze your Analytics account data to find new ways for you to grow your business online. We’ll help you understand how people find your site, how they navigate through it, and how they become loyal users - and we’ll help you take advantage of Analytics features like Content Experiments to help you determine the most optimal layout for your site. We’d love to hear your thoughts -- feel free to share your feedback about this new look for text ads on our AdSense +page. We’re constantly thinking about how we can make our ad formats better for you, your users and the advertisers appearing on your pages. Today we’re happy to share the introduction of favicons to our text ads. A favicon is a small graphic that an advertiser can use to brand their website, such as their company logo. We regularly experiment with small changes to the look of our text ads, measuring the potential impact on user experience and publisher earnings. Our experiments show that adding these favicons to the ads makes advertisers more recognizable to your users, which benefits both you and the advertisers whose ads appear on your sites. , then, in the Ad code box, select 'Asynchronous (BETA)' from the Code type drop-down menu. As before, copy and paste the ad code into the HTML source code of your pages. If you choose to switch to the new code, we recommend switching all of the ad units on your pages in order to give users the best experience. If you’d like to read more on the technical aspects of this tag, take a look at our post on the Google Developers Blog. Let us know if you’re planning to try it out and share your feedback on our AdSense +page. In a perfect world, putting ads on a web page wouldn’t slow that page down at all. We’re striving to get to that point, constantly looking at ways to improve the latency of web pages containing ads, and today we’re happy to share a new beta version of our ad code. This new code (known as an asynchronous tag) enhances user experience on your sites by ensuring site content loads for your users, even if they’re having trouble loading the ad. This is particularly good news for mobile users. 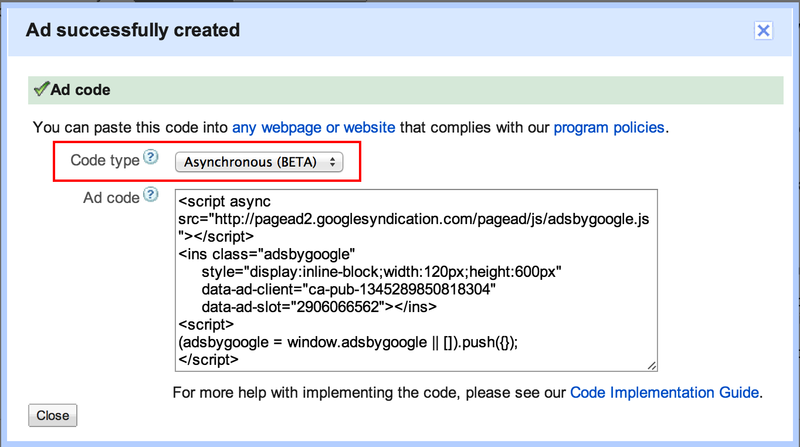 Our new asynchronous ad code is still a beta feature, and so changing over to the new version is optional. In your account, you’ll notice that you’re now able to choose between the new and current versions of the code. 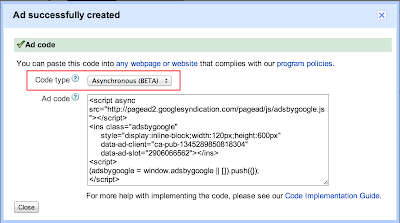 To try the new ad code, follow the steps to create an ad unit, then, in the Ad code box, select 'Asynchronous (BETA)' from the Code type drop-down menu. 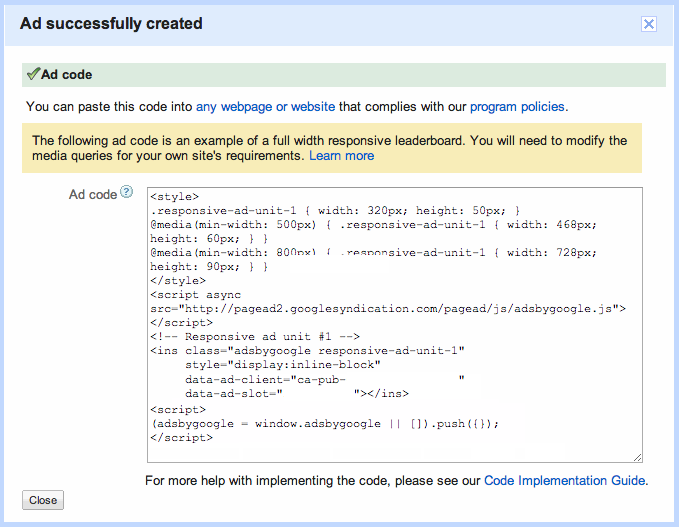 As before, copy and paste the ad code into the HTML source code of your pages.